US. Rep. Mike Michaud answers questions during the Bangor Region Chamber of Commerce debate in Bangor on Tuesday, Oct. 16, 2012. WASHINGTON — U.S. Rep. Mike Michaud, a Democrat who represents Maine’s 2nd District, is “looking at” a 2014 run for governor. Michaud, who has yet to file as a candidate, told Politico on Monday that he hasn’t set a timeline for making the decision about whether to run in a Blaine House race likely to include incumbent Republican Gov. Paul LePage and independent Eliot Cutler, who narrowly lost to LePage in 2010. 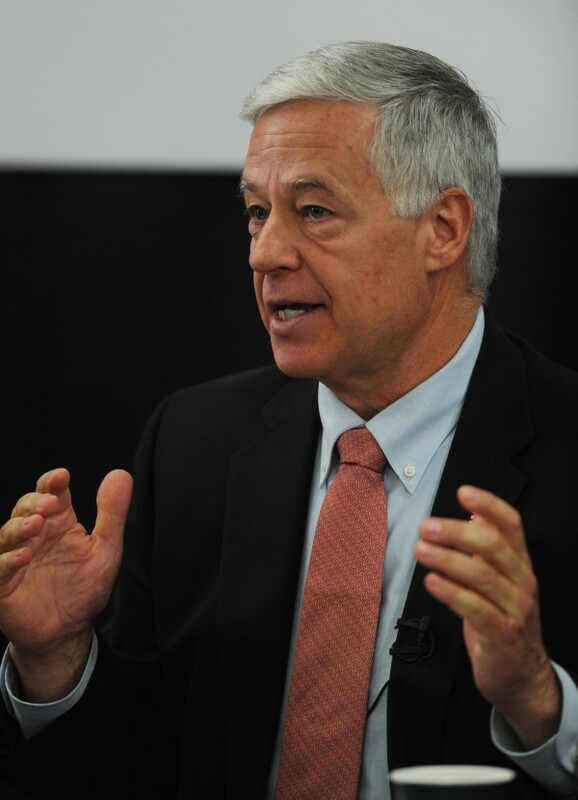 Entering his sixth term in Congress, Michaud told the Bangor Daily News by phone Monday evening that several people have asked him to run for governor in 2014, but that he has made no decision. LePage and Cutler have filed as 2014 gubernatorial candidates. Democrats Steve Woods and former Maliseet Rep. David Slagger, as well as independent Alex Hammer also have filed with the Maine Ethics Commission as 2014 gubernatorial candidates. A voter survey released by North Carolina-based Public Policy Polling in January indicated that Michaud would lead LePage by almost 20 percentage points in a two-person contest for governor. In a three-way race involving LePage, Cutler and Michaud, the incumbent Republican governor would lead with 34 percent to 30 percent for Michaud and 26 percent for Cutler. Public Policy Polling reported that Michaud fared better than four other potential Democratic gubernatorial candidates — 1st District U.S. Rep. Chellie Pingree, former Gov. John Baldacci, Attorney General Janet Mills and former state Sen. (and BDN columnist) Ethan Strimling. LePage has formed a re-election committee but has not formally announced plans to seek a second term. Democrats surveyed for the January poll listed Baldacci as their preferred candidate, but Michaud scored a higher statewide favorability rating. Baldacci, who served as Maine’s governor from 2003 to 2011, also has said he is considering another run for the Blaine House in 2014.